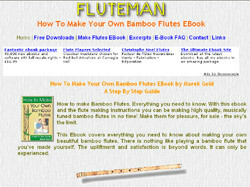 Webspirit New Age Resources And eBooks - A complete step by step guide on making your own Bamboo Flutes. All the ins and outs. Suitable for the beginner flute maker as well as the advanced. Models covered include the Shakuhachi, Side Blown, Native American Flute, Bamboo Sax and Recorder.